Step 1 Combine cream cheese, sour cream, Dijon mustard and lemon zest in a food processor; pulse to combine well. Add gravlax; pulse until almost smooth. Add dill; pulse 2 or 3 more times or just until combined, and scrape into a serving dish. Step 2 Cover and chill for at least 4 hours, or up to 2 days. Step 3 Serve pâté chilled with dark rye bread, crackers and crudité. 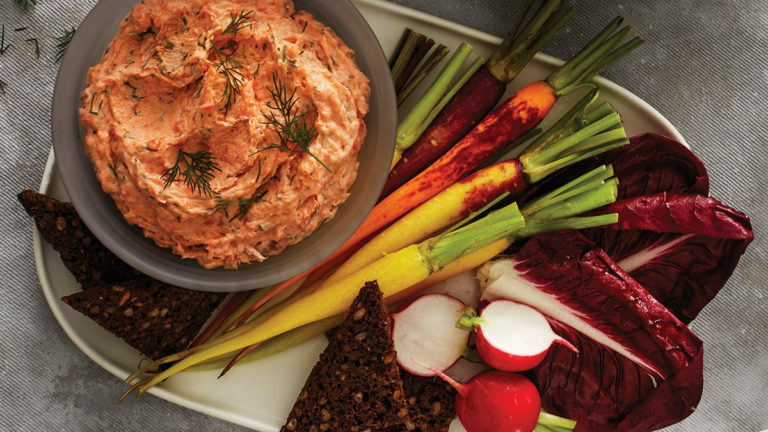 A festive celebration demands a special appetizer to complement the main event, and this pâté is the right mix of luxury and ease. Gravlax is a cured salmon, usually available in the freezer section. No need to thaw it first: It chops up more evenly when it’s a bit frozen.